For other people with the same name, see Edward Harris (disambiguation). Harris was born at the Englewood Hospital in Englewood, New Jersey, and was raised in Tenafly, New Jersey, the son of Margaret (née Sholl), a travel agent, and Robert L. "Bob" Harris (1922–2014), who sang with the Fred Waring chorus and worked at the bookstore of the Art Institute of Chicago. He has two brothers, Paul and Robert. Harris was raised in a middle-class Presbyterian family. His parents were from Oklahoma. He graduated from Tenafly High School in 1969, where he played on the football team, serving as the team's captain in his senior year. A star athlete in high school, Harris competed in athletics at Columbia University in 1969. When his family moved to New Mexico two years later, Harris followed, having discovered his interest in acting in various theater plays. He enrolled at the University of Oklahoma to study drama. After several successful roles in local theaters (such as the Jewel Box Theater  in Oklahoma City), he moved to Los Angeles and enrolled at the California Institute of the Arts, where he spent two years and graduated with a Bachelor of Fine Arts in 1975. From the mid 1970s to the mid 1980s, Harris found steady work on television. He had a role in one episode of Gibbsville (1975), in one episode of Delvecchio (1977), in one episode of The Rockford Files (1978), in one episode of David Cassidy - Man Undercover (1978), two episodes of The Seekers (1979), one episode of Barnaby Jones (1979), one episode of Paris (1980), three episodes of Lou Grant (1979, 1980, and 1981), one episode of CHiPs (1981), one episode of Hart to Hart (1981), one episode of Cassie & Co. (1981), and one episode of American Playhouse (1984). In 1989, his role as David "Dave" Flannigan in Jacknife earned him his first Golden Globe Award nomination, for Best Supporting Actor – Motion Picture. Also in 1989, he portrayed Virgil "Bud" Brigman in the sci fi film The Abyss, directed by James Cameron. In 1995, Harris portrayed Watergate figure E. Howard Hunt in the Oliver Stone biopic Nixon, and received his first Academy Award for Best Supporting Actor nomination for his performance as NASA Apollo Mission Control Director Gene Kranz in Apollo 13. In 1996, Harris starred in and executive produced the television adaptation of Riders of the Purple Sage. That same year, he returned to Broadway as Major Steve Arnold in the Ronald Harwood play Taking Sides. In 1998, his co starring role in The Truman Show earned him a second nomination for the Academy Award for Best Supporting Actor, and a Golden Globe Award for Best Supporting Actor – Motion Picture win. For his lead role as Miles Roby in the 2005 miniseries Empire Falls, Harris was nominated for the Primetime Emmy Award for Outstanding Lead Actor in a Miniseries or a Movie and the Golden Globe Award for Best Actor – Miniseries or Television Film. Also that year, he played a vengeful mobster in David Cronenberg's A History of Violence (2005) starring Viggo Mortensen. In 2006, he portrayed composer Ludwig van Beethoven in the film Copying Beethoven, and starred in the television documentary film The Armenian Genocide as American diplomat Leslie Davis. He next appeared alongside Casey Affleck and Morgan Freeman in the Ben Affleck directed neo noir mystery film Gone Baby Gone (2007). Harris then co-starred as the antagonist Mitch Wilkinson in National Treasure: Book of Secrets (2007), alongside Nicolas Cage. In 2012, he co-starred alongside Sam Worthington in the thriller film Man on a Ledge for Summit Entertainment. He then won the Golden Globe Award for Best Supporting Actor – Series, Miniseries or Television Film and was nominated for the Primetime Emmy Award for Outstanding Supporting Actor in a Miniseries or a Movie for his performance as Senator John McCain in the HBO made for television drama Game Change. ^ a b c d e f "Ed Harris". Inside the Actors Studio. Bravo. ^ a b Barnes, Mike (February 16, 2014). "Bob L. Harris, Father of Actor Ed Harris, Dies at 91". The Hollywood Reporter. ^ Stein, Ruthe (January 9, 2000). "Ed Harris Has the Righteous Stuff, Too: Actor plays a particularly convincing priest in `The Third Miracle'". San Francisco Chronicle. Retrieved December 10, 2007. ^ Pearlman, Cindy (February 6, 2000). "Love the sinner: Harris repents for 'money' roles". Chicago Sun-Times. Retrieved December 10, 2007. ^ Koenenn, Joseph C. (March 16, 1986). "Ed Harris: Inhabiting his characters". Newsday. ^ Stein, Ruthe (March 25, 2001). "They're Ready For Their Close-Ups: Camped out at Oscars, the starstruck wait to sneak a peek". San Francisco Chronicle. Retrieved May 31, 2007. She's hoping to score a seat near the front and catch the eye of Oscar nominee Ed Harris, who went to Tenafly High School in New Jersey with her mother. ^ a b Kachka, Boris (October 9, 2006). "Man, Oh, Man Ed Harris is not a control freak. Got that?". New York. ^ Thompson, Ryan. "Method Man: Ed Harris". The Rake. Retrieved 18 January 2019. ^ NPR Staff (8 March 2014). "The Unforgettable Performance Ed Harris Doesn't Remember". NPR. Retrieved 18 January 2019. ^ "Ed Harris: Performer". Playbill. Retrieved November 13, 2015. ^ Ebert, Roger (March 24, 1989). "Jacknife Movie Review & Film Summary". RogerEbert.com. ^ Nassour, Ellis (October 16, 1996). "Ed Harris Seeks the Man Behind the Uniform". Playbill. ^ "The Truman Show - 1998 Academy Awards Profile". Box Office Mojo. Retrieved November 13, 2015. ^ Fleeman, Michael (January 24, 1999). "'Private Ryan', Spielberg Win Golden Globes". The Washington Post. ^ Helmore, Edward (February 25, 2001). "Ed Harris: The ultimate splasher movie". The Guardian. ^ Michael, David (February 12, 2003). "Ed Harris – The Hours Interview". BBC News. ^ "Ad of the Week: Vauxhall puts Vectra on trial". www.telegraph.co.uk. 18 June 2002. Retrieved 21 September 2017. ^ Hernandez, Ernio (May 28, 2005). "Philip Seymour Hoffman and Paul Newman Star in "Empire Falls" HBO Film, Debuts May 28–29". Playbill. ^ "How Ed Harris learned Beethoven". BBC News. November 2, 2006. ^ "Ed Harris Joins Ben Affleck's 'Gone, Baby, Gone'". MovieWeb. April 20, 2006. ^ Brevet, Brad (March 28, 2007). "Mirren and Harris Join 'National Treasure 2'". ComingSoon.net. ^ Lopez, John (November 11, 2010). "Could Ed Harris Finally Win an Oscar for The Way Back?". Vanity Fair. ^ McNary, Dave (October 29, 2010). "Ed Harris joins Summit's 'Man on a Ledge'". Variety. ^ Rose, Lacey (March 23, 2011). "Ed Harris to Play John McCain in HBO's 'Game Change'". The Hollywood Reporter. ^ Fleming Jr, Mike (April 17, 2012). "January Jones And Ed Harris Star In 'Sweetwater'". Deadline Hollywood. ^ McClintock, Pamela (February 8, 2011). "Diane Keaton, Ed Harris to Star in 'Look of Love'". The Hollywood Reporter. ^ Cochran, Amanda (March 8, 2014). "Did you spot Ed Harris in "Gravity"?". CBS News. ^ Kroll, Justin (August 5, 2013). "Ed Harris to Co-Star With Ethan Hawke in 'Cymbeline'". Variety. ^ Gerard, Jeremy (October 8, 2015). "'American Horror Story's Taissa Farmiga Joins Ed Harris, Amy Madigan In 'Buried Child' Revival". Deadline Hollywood. ^ Kroll, Justin (January 30, 2015). "James Franco Assembles Cast for Adaptation of 'In Dubious Battle'". Variety. ^ Stedman, Alex (August 11, 2014). "Ed Harris Joins HBO's 'Westworld' as Key Villain". Variety. ^ Kit, Borys (August 15, 2014). "Jim Sturgess, Abbie Cornish in Talks to Join Gerard Butler in 'Geostorm' (Exclusive)". The Hollywood Reporter. ^ Andreeva, Nellie (July 22, 2014). "Ed Helms, Hilary Swank & Ed Harris In Talks To Star In Alejandro González Iñárritu's MRC Series 'One Percent'". Deadline Hollywood. ^ McNary, Dave (April 15, 2016). "Domhnall Gleeson, Michelle Pfeiffer Join Jennifer Lawrence in Darren Aronofsky Drama". Variety. 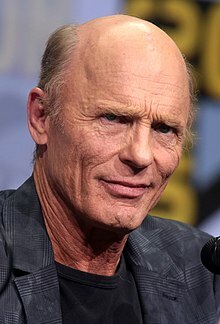 ^ "Biography: Ed Harris". Lifetime. Archived from the original on November 17, 2015. Retrieved November 13, 2015. ^ Handel, Jonathan (February 27, 2012). "SAG/AFTRA Anti Merger Lawsuit Drops Demands". The Hollywood Reporter. Retrieved 25 November 2018. ^ Handel, Jonathan (May 22, 2012). "Dismissal Formalized in SAG-AFTRA Merger Lawsuit". The Hollywood Reporter. Retrieved 25 November 2018. ^ Saval, Malina (March 13, 2015). "Ed Harris Receives Star on the Hollywood Walk of Fame". Variety. Penske Business Media, LLC. Retrieved 25 November 2018. 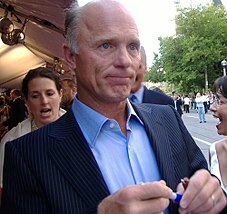 ^ "Ed Harris". Hollywood Walk of Fame. Retrieved 21 September 2016. ^ "Dr. Ronald Crutcher, national leader in higher education, announced as Commencement Speaker". Muhlenberg College. April 29, 2015. Archived from the original on May 3, 2015. ^ "'Wrecks' Actor Ed Harris Is Not a Control Freak". NY Mag: 2. Retrieved 8 July 2017.